Jonida Rustemaj graduated from University of Vlora “Ismail Qemali” with a degree in Master of Science Mathematical- Finance. In 2010 she graduated in Business Administration, Faculty of Economics, University of Vlora. 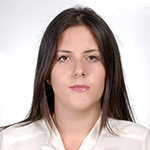 Since 2010, she is regional expert at the “Observatory for Children’s Rights ” in Vlora region. Jonida is actively lobbying for the rights of children in Vlora Region , in drafting Regional Strategies for the Children Rights, managing volunteers and providing funds for children out of parental care . Part of her work is preparation of annual reports in the field of Children’s Rights.